At a Christmas sing, held at Stetson Hall, Randolph, in 1892, the matter of joining in giving a concert at the World's Fair was brought before the Society. This desire was in the mind of our President, Mr. Billings; of our Conductor, Mr. Soule; and our Secretary, Mr. Jones; and others. Correspondence was entered into by President, Conductor, and Secretary, and others, all looking to the securing of a place among the organizations which would be represented at Chicago. A meeting of the committee of the Old Stoughton Musical Society was held in the Turner Library at Randolph, Wednesday P. M., March 15, 1893. Those present at the meeting: Conductor Soule of Taunton, James S. Allen of East Bridgewater, Elijah G. Capen of Stoughton, George N. Speare of Holbrook, John B. Thayer, Daniel H. Huxford, William Porter and Dr. C. C. Farnham of Randolph. A committee was organized by choosing Dr. Farnham as chairman and Daniel H. Huxford as secretary. At this meeting a communication from G. H. Wilson, of the Musical Bureau, Chicago, was read by Conductor Soule, suggesting that two (2) concerts be given, August 15 and 17, 1893. It was voted that the communication be accepted and it was recommended that its provisions be adopted. It was also voted that a committee of three (3) be appointed to confer with a committee from Stoughton. Messrs. Leander Soule, John B. Thayer and James S. Allen were chosen said committee. On Wednesday, the 22d of March, at 3 P. M., a second meeting was held at the Turner Library. Dr. Farnham in the chair and Mr. Huxford serving as secretary. 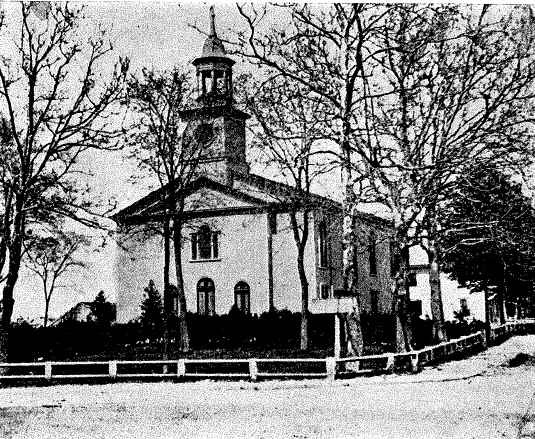 At that meeting there were present, Leander Soule, Dr. O. C. Farnham, D. H. Huxford, Elijah G. Capen, Edwin A. Jones, George E. Bird and L. W. Standish of Stoughton, George N. Speare of Holbrook, and George Merritt of Rockland. A report was presented by Mr. Standish of the result of the conference ordered at the previous meeting. A committee of five was appointed to fill vacancies, consisting of Messrs. G. N. Spear, E. A. Jones, L. Soule, L. W. Standish and George E. Bird. Voted that a board of five Directors be chosen to have general management of the enterprise; that one be a general director; that there be a finance committee, a program committee, and a committee on transportation. At this meeting matter seemed to take the appearance of business, and there seemed to be a determination to make it a success. For Directors: Leander Soule, Edwin A. Jones, Dr. C. C. Farnham, James S. Allen and Sanford Waters Billings. For Finance Committee: Henry L. Pierce, Boston; Charles F. Porter, Brockton; Charles N. Draper, Canton; L. W. Standish, Stoughton ; George N. Speare, Holbrook; James T. Stevens, South Braintree; Dr. George B. Cogswell, North Easton; George C. Spear, Randolph; James S. Allen, E. Bridgewater; Henry Reed, North Abington; S. F. Packard of Campello; and Dr. E. S. Powers of Brockton. For Chorus Committee: John B. Thayer, Randolph; E. G. Capen, Stoughton; Henry S. Porter, Brockton; George N. Speare, Holbrook; George Merritt of Rockland; Leander Soule, Taunton; Dr. T. H. Dearing, Braintree; Frank W. Crane, Avon; Charles H. Eager, Canton; L. Morton Packard, Brockton; Mr. Marshall, North Easton; L. W. Richards, E. Bridgewater. Program Committee: E. A. Jones, John B. Thayer and Alanson Belcher. Transportation Committee: James S. Allen, Leander Soule, L. W. Standish. The report of the committee was duly accepted and adopted, and an adjournment of the meeting was made until Fast Day. On the 25th of March, a meeting of the Directors was held in Boston, all the members being present. The Board was organized by choosing S. W. Billings, Chairman, and E. A. Jones, Secretary . At this meeting, the Directors voted to call a full meeting of all the committees at the Turner Library in Randolph on Fast Day, and another meeting of the Directors Was ordered for April 1. This meeting was duly held in Boston on said date, all the members being present. It seemed desirable to the Directors that the duties of the various committees should be outlined. Votes were passed defining the duties of said committees, such matters being assigned them as seemed to the Directors would expedite and systematize the work before the Society. On Thursday, April 6, Fast Day, the proposed meeting of the general committee was held at the Turner Library. Dr. C. C. Farnham in the chair. In the absence of the Secretary, Mr. Jones was chosen pro tern. The following persons, besides the officers of the committee, were in attendance: Charles N. Draper, James T. Stevens, L. W. Standish, E. G. Capen, J. 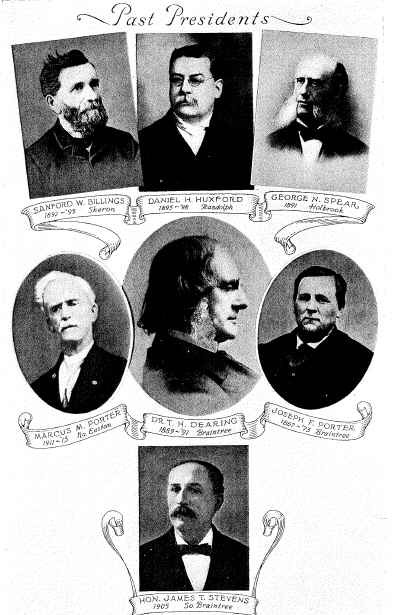 B. Thayer, E. A. Belcher, Leander Soule, J. S. Allen, George Merritt and S. W. Billings. Some slight changes were made in the records of the last meeting by which the name of Henry L. Pierce was omitted from the Finance Committee at his solicitation, and the printing of a Souvenir volume placed under the direction of the Program Committee instead of that of Finance. The Finance Committee was enlarged by the names of John J. 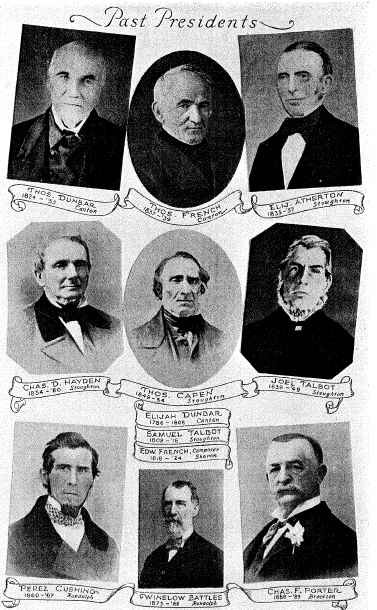 Loud of Weymouth, William Dyer of South Weymouth, Charles H. Eager and Morris B. Noyes of Canton, Dr. W. O. Faxon and George A. Wales of Stoughton, Azel R. French, Grace W. Allen and Elisha A. Belcher of Braintree. The following were added to the Chorus Committee: Willis S. Shepard and James H. Eager of Canton, Nelson Mann and George C. Spear of Randolph, P. C. Farnham of Abington, Mr. Williamson of North Abington, E. A. Jones and Alanson Belcher of Stoughton, E. E. Richards and F. L. Fish of Taunton, Mrs. L. V. Colburn and J. W. Perry of Sharon, A. L. Drake of Easton, and Louis P. Nash of Hingham. The Directors were authorized to prepare a circular for distribution, urging co-operation in the work, and they were also empowered to add new members to the committees or to fill vacancies on said committees. This meeting was adjourned subject to the call of the Secretary. Meetings were frequently held during summer and spring by the board of Directors who were aiming to carry out the work to a successful issue. At a meeting of this board, held April 29, it was voted to hold a mass rehearsal at Brockton as soon as possible. At a meeting held May 6, Dr. C. C. Farnham, the Treasurer of the Society, was elected Treasurer of the board of Directors. At another meeting, held May 13, Preston B. Keith, of Campello, was made an honorary member of the Society, and placed upon the Finance Committee in place of E. S. Powers, who had resigned. On June 3, a vote was passed to engage rooms for at least 100 people in Chicago University Buildings, and Mr. George N. Spear was elected Treasurer in place of Dr. Farnham, who was absent in Chicago, Mr. Spear to serve until the return of Dr. Farnham. It was also voted that the Treasurer pay no bills unless endorsed by the board of Directors or a majority of them. At the other meetings held before August 11, the efforts of the board of Directors were directed to the success of the Society's work. During a part of this time, our honored Secretary, Mr. Jones, was unable, in consequence of ill health, to attend to those duties he had so faithfully performed. But through the care of friends, and the blessing of the Father above, he was carried through the trial and was ready for the proposed excursion at the appointed time. He told his friends he should go to Chicago if he had to be taken from his bed to go, but this was not to be required of him. He was able to be with us, a leading spirit in the enterprise he had cherished so long. Rehearsals were held during the months of July and August at Avon, Brockton, Randolph, Sharon, and Stoughton. These were conducted by our leader, Mr. Soule, whose cheer and enthusiasm ever gave life to the work. His fidelity in this preparatory work will not soon be forgotten. On Friday, August 11, there could be seen toward evening at the Union Station, Boston, a large number of those who were to start for the City of the Lake. This number continually increased, some appearing who had not dared to hope that the privilege of attending the World's Fair in Chicago with the Old Stoughton Musical Society would be theirs. Tickets were in great demand, and a new call for them was made. The number had well nigh outgrown the accommodations that could be provided by the Railroad Company, yet all were able to find a standing place, even though things were in a confused condition. The train started from Old Boston, bearing this loving freight of friends, who were to join in this great act in our Society's history. Arrangements were at once commenced to find a resting place for the different members of the party. This was arranged as best it could be done. Soon, however, we were retarded on our way by a "Hot Box." But all were determined to make the best of our condition, and we sped onward, believing we should arrive at our destination in due time. The first night was largely spent in preparation for the second. The assignment of berths by the Transportation Committee was a severe task, and it was late before all found a place to rest their weary heads. Saturday morning found us out of the limits of our dear old Republic, and upon Canadian soil. We reached Montreal in due time for breakfast. After a waiting of thirty minutes, we hastened on our way over the Grand Trunk Railway from Montreal to Port Huron. Saturday was a delightful day for travel. The dust had been laid by a rain and everything without added to the enjoyment of the trip. After a day's ride, we reached Toronto. Here, the whole party left the train and joined in the familiar strains of "My Country, 'Tis of Thee," with zest. We never heard America sung with more of the spirit of patriotism; although upon a foreign soil, the applause we received showed that those soul-stirring words of loyal devotion to fatherland drew out a quick appreciation from the listeners. The grand old tune of Holden's "Coronation," with its "All hail the power of Jesus' name," that hymn and tune which, though a century old, have awakened Christian life around the world, was then sung. "Auld Lang Syne" was the closing song, and we were sure that with us "Auld Acquaintance" would not be forgot. During the day we had enjoyed beautiful views of Lake Ontario, and had been inspired by the expanse spread out before us. At night we sought our berths at a comparatively early hour, and before morning dawned we had crossed the border line and were once more in the land of the free. This Sabbath morning dawned most charmingly. We traveled on, realizing that our train was late, yet in hope, seeing in the distance the famous Ferris Wheel of the Exposition. About 12 o'clock noon we were in the City. We hastened to the University rooms, and soon found our accommodations, ample and attractive, which had been provided by our faithful committee. Toward evening a rehearsal was held in one of the lecture rooms. The music was taken up with alacrity, and we have never heard the old music rendered better. Every one was at his best. On Monday at 3 P. M. the first concert was given, the members of the chorus and orchestra appearing in costume. There were 2,000 in attendance. The Conductor was enthusiastic, hopeful, and proud of the Society whose concerts he was to conduct. The chorus caught this spirit of cheer and enthusiasm and sang as only those can sing who are inspired with the music of the Father. The orchestra was led by Mr. E. A. Jones, who looked upon the work of the day with delight and interest, realizing that the long looked for time had come, the expected day had arrived, and that grand results were developing as each new selection was announced. His select company of artists forming the orchestra who took the place when others had failed, won for themselves enviable distinction, while the soloists won from the listeners many an approval, and the grand old songs of the fathers, the composition of the pioneers in American music, so heartily rendered by the chorus, won the repeated applause of those who had come to hear the strains of yore. Some expressed the thought that nothing had given them so much delight, had so thrilled their souls, so aroused the tenderest and strongest chords of the human heart as the rendering of Easter Anthem, Emmanuel, Contentment, and the other selections their ears had been permitted to hear. An especial feature of the concerts was the appearance of Mr. Alanson Belcher who, at the invitation of Conductor Soule, led the chorus through the inspiring strain of "As Shepherds in Jewry Were Guarding Their Sheep." Where could we go to find a parallel of this, to see the grand musical Patriarch of more than four score years step to the front, wield the baton, mark the time, and throw from his own soul into the souls of others the inspiration of one who, though his brow was frosted with many a winter, seemed like one in the grandeur of life's prime ? His soul was in his song. His was not the service of the lip; his was the thanksgiving of the heart. On Tuesday, the concert was repeated, losing none of its beauty or excellence. Those who had listened to the songs which used to be sung by lips long since silent in the days "that are past and gone," experienced a pathos and rapture that widen and deepen as the song goes on. The Chicago Record, World's Fair Bureau, the Chicago Inter-Ocean, and Chicago Tribune all gave reports of commendation. That was a delightful event which happened at the Massachusetts Building on Wednesday, P. M., when, surrounded by representatives, not only of the Old Bay State but from other commonwealths of the Union, and from foreign countries, our Society gave in the parlors of the State Building one of its best efforts. So inspiring were the strains, so inviting to the ear, that ere one selection was completed, the rooms were filled to overflowing. Massachusetts was doing through the Old Stoughton Musical Society what no other state in the Union had thought of doing, bringing the songs of the past century of the Bay State to the ears of the representatives of the World at Chicago. At this gathering, Mr. Belcher gave with fine effect the "Boston Tea Party." The manner and vigor of the singer and the patriotic spirit of the song will not soon be forgotten by those who were so fortunate as to be present. But this eventful day of Wednesday was not to close with this impromptu meeting at the Massachusetts Building, where we had been so kindly invited and so cordially welcomed by Mr. and Mrs. Stock-dale. Another invitation came from Mr. Wallace S. Shaw, the manager for Hon. Henry L. Pierce who is proud to own Stoughton for his birthplace and but for whose benevolence this memorable work of our beloved Society might have resulted in failure. We must not end our visit in Chicago or complete the grand and enthusiastic work of the day without being the guests at the beautiful pavilion of the Walter Baker & Co. Chocolate Works. The courtesies of the house were extended to the Society and that eventful day was closed with another season of song, when the same inspiration was awakened that had been everywhere manifested. "While Shepherds watched their flocks by night, All seated on the ground, The Angel of the Lord came down, And glory shone around," was wafted out upon the evening breeze. The remaining days of our tarrying were then ours for visit and enjoyment in the grandest errand of the century. We had felt the burden of responsibility that was upon us to render the name of our Society illustrious in the work which had been given us to do. Our work had been well done. Thursday, Friday, Saturday and the Sabbath, which remained to us, were crowded with individual work and interest. On Monday, August 21, we. left Chicago and started on our way homeward. We found that the ties of friendship which had been formed were more closely drawn and the bonds of sympathy more firmly cemented. Several pleasing incidents and experiences attended our party, homeward bound. The hours spent at Niagara Falls were supremely enjoyable and the day was far too short to drink in all the beauty and grandeur and sublimity of Nature's wonders spread out all about us. Another pleasing incident of the return journey was the delightful episode in which Dr. T. H. Dearing and Mr. Alanson Belcher played so important a part. Dr. Whitney and others had learned that our dear friend, Mr. Belcher, was passing his 83d birthday. Such an event could not be neglected by his many friends. There must be some memento of this so important event—the birthday of a man entering upon his 84th year while returning from one of the richest experiences of a well rounded life. An album was purchased, the names of all the party were inscribed upon its pages, and when the proper time came, which was at St. Albans, Vermont, Dr. Bearing, in a most happy and felicitous speech, presented this token of remembrance to our dearly loved, venerable friend. Mr. Belcher had no time for reply, but we all saw as we looked into the face of the grand old man, there were emotions in his heart that may never find expression in words. Would that we had time and ability to express our estimation of the worth of many upon our trip, and of some, who were not permitted to join us in our excursion. But we feel compelled to name one or two. Dr. C. C. Farnham performed excellent work when the plan was in its inception. He ever spoke for us words of encouragement and advised us, if possible, to perfect our plan and persevere until the end was reached. He carefully guarded our finances, and cared for those things which have been styled the sinews of war. No one watched our departure with more interest, no one caught the grand result of our work as it came to his eye upon the printed page, with more ardour, and no one welcomed our happy and successful return with more devotion and tenderness than he. Who can tell the value of the work done by Hon. James S. Allen. His was truly a Herculean task, night and day he cared for all. Before our departure, he spent many an hour in completing the necessary arrangements for our journey, and from the time we left the station in Boston on that memorable Friday, August 1893, until our return, the interest and welfare of every one was uppermost in his mind. He carried the weight of many a burden. His endurance, fidelity and patience never failed. These all shall receive the appreciation and commendation of our sincerest souls. Of the cheer, devotion, and enthusiasm of our Conductor, Mr. Soule, we have already spoken. Of the courage, inflexibility, persistency, perseverance and undying faith in the work of the Society, shown by the leader of the orchestra, Mr. Jones, we have already made mention. Both of these men in their respective places were an absolute necessity for the crowning of our work. We desire also to refer to the assistance rendered by the editors of the two (2) local papers especially interested in our work. The gentlemen connected with the Randolph Register, Mr. D. H. Huxford, and the Stoughton Sentinel, Mr. L. W. Standish, were so glad to speak a work to aid the Society in its work. The encouragement and assistance thus rendered were helpful when they were needed, and our appreciation of their worth is here recorded. Those who aided by their contributions were truly friends in deed. Dark days were passing over our land financially, while we were urging on this enterprise. Many who would have gladly responded under the circumstances were obliged with regret to decline to give. Others there were who returned in cheerful response with a substantial gift. To all such we offer the recognition of our choicest gratitude. In a word, all who joined in any way in rendering this work of the Society so successful, whether it be the one who, while remaining at home, bestowed a gift from the purse, or the one who joined in the grand chorus of Music Hall, or the one who, with instrumental music, sustained the voice of this grand chorus, must continually rejoice in the work accomplished, and point with delight to the record it has written. As we returned, the hope was expressed that there might be a reunion from time to time of those who joined this grand undertaking. Such reunions would certainly keep alive that which was so important in the minds of those who were present at Chicago in August, 1893. We commend them as worthy of continuance and perpetuation. However that may or may not be, may the annual Christmas gathering tend to hold united both those who are permitted to join in the eventful work of the Chicago Exposition, and those who are with us today, or may come after us, to perpetuate this musical organization, which today is entering upon its one hundred and tenth (110) year of eventful life. What has this Society done? We may not recite all. But these things it has done. It has kept alive the music of the Fathers for 109 years. We are singing today the strains that were sung in 1786 when this organization had its birth. It has celebrated a centennial, which event has not yet been reached by any other musical organization in this country, and showed in that Centennial that it was well worth a place in the sisterhood of musical organizations in this country, and last but not least it has performed before the eyes of the world the music from the American composers of a century or more ago, and left an historic impress in this style of musical composition that no other society has done. Just this has been its latest work—it responded to the cordial invitation to present the American music of the olden days to the gaze of the world. In this act it has surpassed every other musical organization in this country. In this act it stands alone in its presentation of that music which will be preserved for generations to come. This is a grand historic honor. The annals of music will contain the record of this work on its pages, and advancing days and months and years and centuries will intensify the importance and perfection of its work and brighten and illumine the lustre of its glories. The Transportation Committee made arrangements to purchase round trip tickets, via Boston & Maine and Grand Trunk Railway, for $26.00 per person, also to house the members at the dormitories of the Chicago University, and to give from the contributed fund a rebate of $10.00 per person, so that the whole necessary expense should not exceed $40.00. It was afterwards found expedient to raise this limit to $45.00, and it was done with the consent of nearly all of the members of the chorus. Music Hall Series Nos. 38 and 39. Edwin A. Jones, Leader of Orchestra; L. Soule, Chorister. Contralto; Frank A. Dunham, Tenor; Thomas A. Norris, Bass.